The Sandy's are Running Together!!! I received my fabric post card this week. Thank you ddr Quilter. It features my house. I affectionately call it "AJ's House". I finally, finally finished my CS quilt. Not quite bedside, but works for me. Jodi tested and approved! Boxy Stars leader and ender project. Not much progress. I need to cut more strips for my project. EQ7 now has a MAC version. I downloaded it to my MAC Book Pro. I now, after all these years, decided to try and learn how to use EQ. Nonnie uses it a lot to design her blocks. 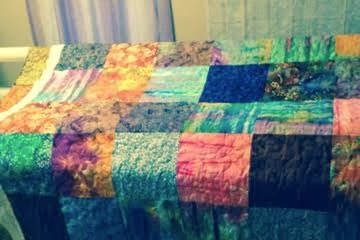 She has inspired me to learn EQ for designing quilts. I have designed a "QOV" block/quilt, paper pieced version. There is one problem, the block is not printing with the block numbers nor has it printed the black stittching line. As usual, I chat while mobile. Binding and binding application discussion. A quick update on my Hexie progress. St. Patty's Weekend Giveaway!! Will it be a ruler or fabric? You guessed it!! It's four FQs. Perfect to add to your modern stash collection. Or, just simply to your stash! 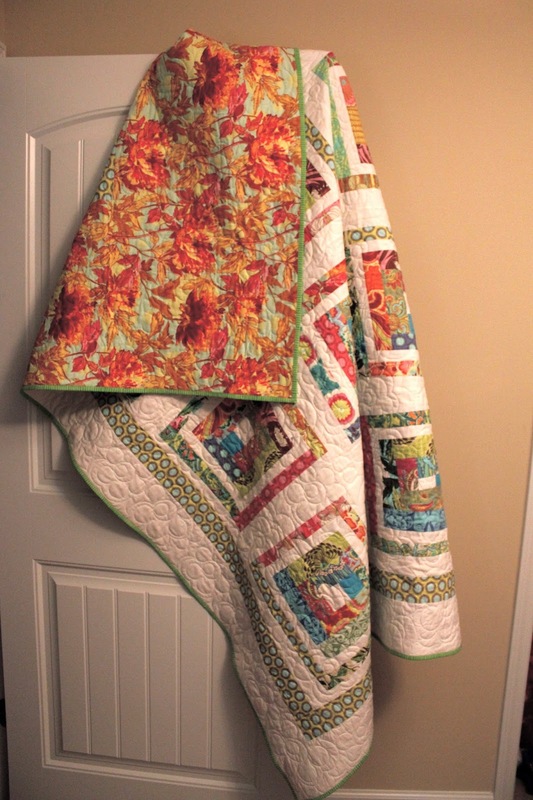 My chartiy quilt was mailed last week. If I wasn't such a, such a..can't think of a phrase, I would have taken a picture before I folded it to fit the box!! Dah! Never the less, here are some additional pictures. 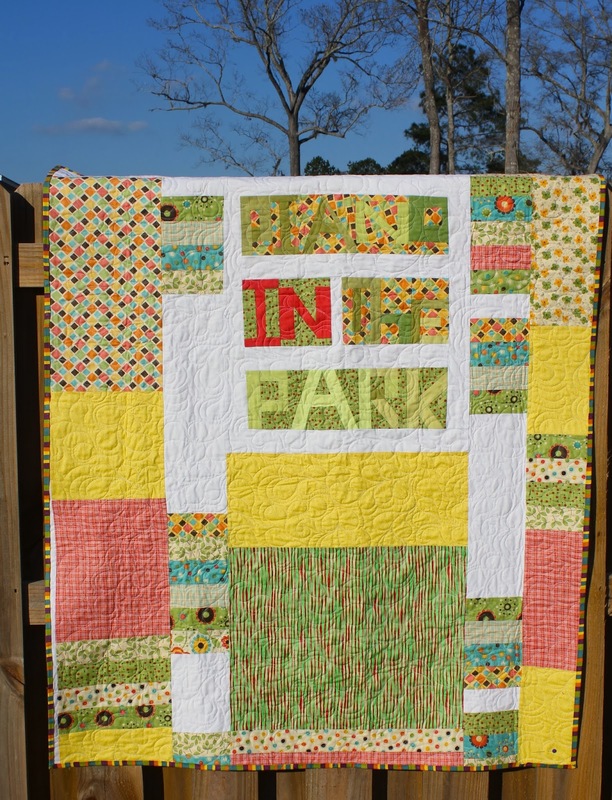 Super secrect project: Fabric Post Card (FPC) Swap. The postcard was mailed the same day as the charity quilt. I hope my partner receives it soon! SORRY, no picture to see here. Maybe later. QOV fabric collection started and a little extra. I have my eye on a kit for a one in Quilty magizine. Plan my closet organization for my March day off. 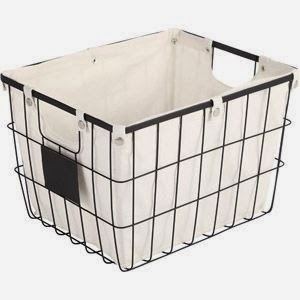 Collecting wire baskets for the shelfs. I am participating in two UFO challenges for 2014! The first is being hosted by Daisy of "Very Lazy Daisy Podcast". She talks about it on her blog. BTW, there is a Flckr link as well. Go check it out! Second, the "2014 Finish Along". There is a button on my blog that will take you the information. Check that out too. I finished my second UFO quilt for this 1st quarter!. One more to go and I will have finished my goal for this quarter. I am planning my binding for my 3rd UFO for the quarter and also for Celtic Solstice. I hope to have both complete by the end of March. At least, that's my goal as of today! That could change at any given time!! LOL!! 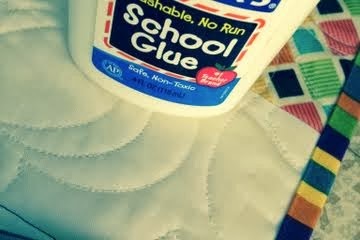 A new to me technique using Elmer's "Washable" Schoo Glue to attach bindings to finished quilt tops! I gave a quick run down during the podcast. If you need the skinny, I have added a YouTube snippet. The version I watched was about 28 minutes long. You can probably search for the longer version. A little about the process. It is a little more time consuming if your follow her instructions exactly. I do recommend that you do follow her instructions. 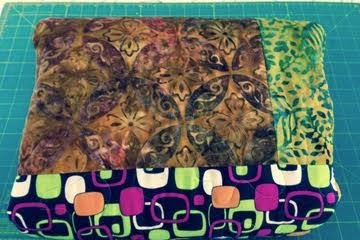 I will say, this is my best binding in my quilting history!! I will be doing this more often. I hope to get a little quicker at the process. Just so ya know, this is not a fast process no matter how many quilts you do this way. My longarm practice is still in the planning phase. I have a rough sketch of the whole cloth design I plan to use. I will now plan it out on graft paper. But, before I get to the quilting phase, I will be using some of the yardage for practice!. 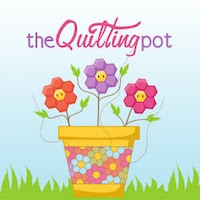 My FMQ practice will be designs I have seen by Angela Walters and Lynn Durbin. BTW, Lynn Durban has a new FM design on YouTube! I have titled my hexies as my "little engine that could" stitching. Do you remember that engine? It just kept chugging up that hill until it made it to the top! After that, it was downhill all the way! In hexie speak, the top of the hill would be having all the flower done and downhill would be attaching all of the flowers. That will be some time from now. Until then, I'll just keep chugging.